Late last year, a group of scientists led by Dr. Melba Ketchum announced that they had sequenced the genome of a bigfoot, (also known as sasquatch or yeti), a furry, mountain-dwelling creature generally considered mythical. Not surprisingly, most mainstream scientists questioned Ketchum’s paper on the “Bigfoot Genome”, which, after being rejected by all the peer reviewed journals in the field, was published in De Novo, a brand-new journal which has published nothing else since. 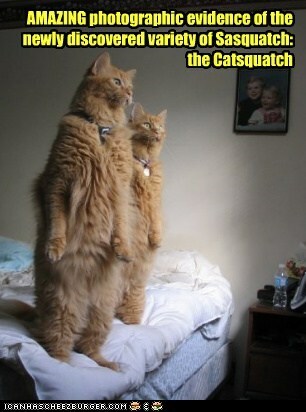 The paper asserts that bigfeet are hybrids, the product of humans interbreeding with a still unknown species of hominin. Now a British scientist has come forward with more exciting news for cryptozoology fans. Oxford University geneticist Bryan Sykes recently reported the findings of a project which tested hair and tissue samples that people claimed belonged to bigfeet, yetis or sasquatches. According to Sykes, DNA from two hair samples from the Himalayas matched the genetic signature of an ancient polar bear jawbone that was found in the Norwegian Arctic in 2004. Although intrigued by the possibilities, most scientists in the field are withholding judgment until Sykes’ data are published and subject to peer review. 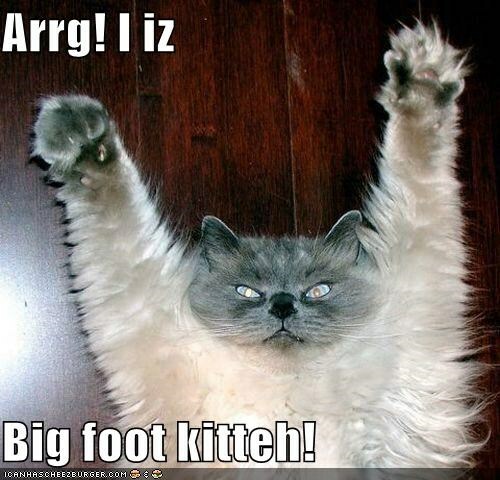 So maybe bigfeet are the descendants of prehistoric polar bears. Or maybe they’re half-human. 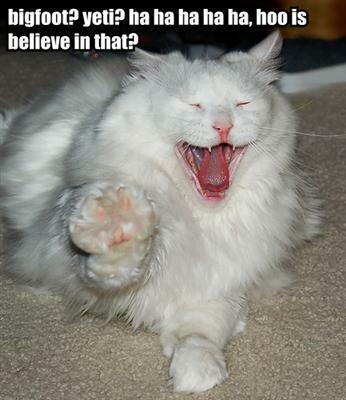 Or maybe, just maybe, they’re cats. Nobody has tested the DNA yet, but the visual evidence is strong. 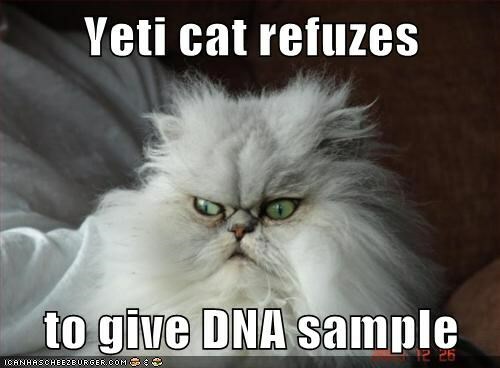 This entry was posted in Science Caturday and tagged bigfoot cat, bigfoot dna, bigfoot science, melba ketchum, sasquatch cat, science lolcat, yeti cat. Bookmark the permalink.